After reading the article below, you can also avail of all the latest deals and coupon codes that come with FREE SHIPPING from Artscow.com. 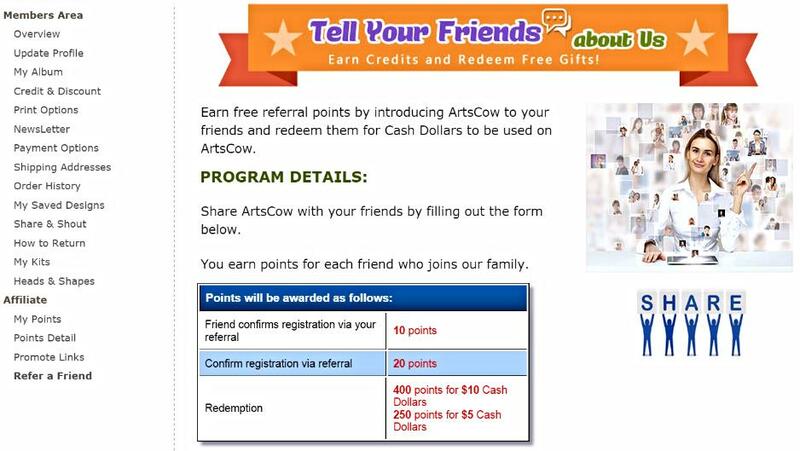 Simply copy and paste each code before going to the Artscow.com website. I recently received an email from Artscow informing me of their Totally Bonkers Sale. 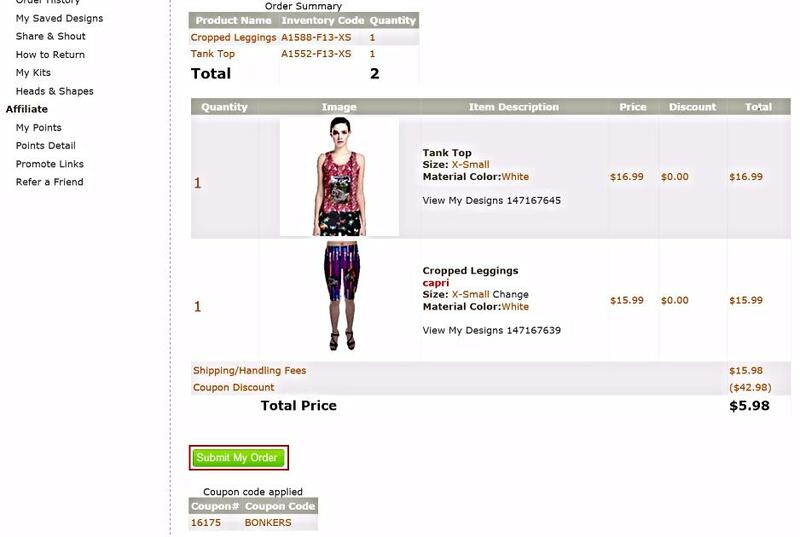 I thought that this was one of their amazing clothing deals so I tried to visit their website, look at the first 2 items that I liked and started designing and customizing it for just $2.99 each, which saved me a total of $42.98 by applying the coupon code BONKERS. I only ordered 2 Items which had qualified for $2.99 each and paid $5.98 (with the coupon applied to it). This was so affordable compared to other websites which you can also customize and personalize your orders. 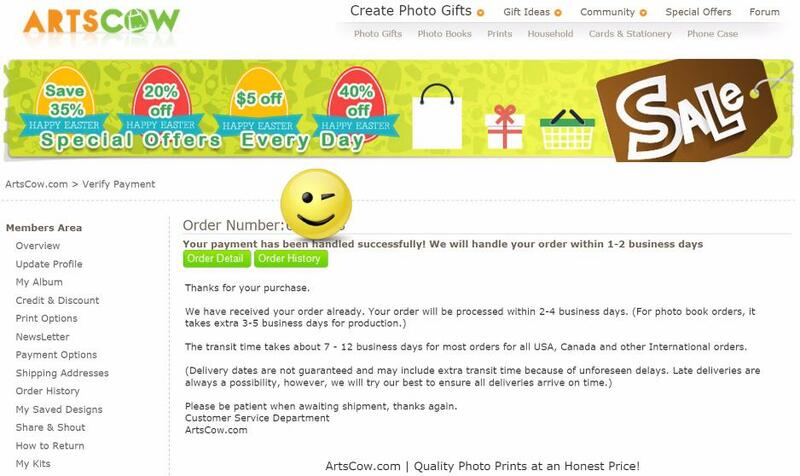 Below are the order details of my Artscow purchase. The total of my items was $32.98 and $15.98 for shipping and handling but with the use of the coupon code BONKERS (with an expiration date on 4/15/15), the order total was only $5.98 with a huge discount of $42.98. Their wardrobe that are on sale that you’ll only be paying for $2.99 each plus free international shipping are their Crop Top (Price: $14.99), Bodycon Skirt (Price: $15.99), Spaghetti Strap Top (Price: $15.99), Racer Back Crop Top (Price: $14.99), Tank Top (Price: $16.99), Capri Leggings (Price: $17.99), Leggings (Price: $19.99), Tights (Price: $19.99), Cropped Leggings (Price:$15.99), and Skinny Shorts (Price:$13.99). If you want to avail this types of deals or sale, you can simply visit Artscow and enter the code that you have at the check out to get free shipping too. I was able to subscribe to their newsletter and have been enjoying most of their offers which included Free International Regular Airmail Shipping. Based on my experience shopping on their website, all of their Offers cannot be used in conjunction with any other promotional offers. With my experience being a customer, I am satisfied with the products that they had delivered to my door. I was hesitant before to order online from them but I noticed that they have a Secure Ordering Online. 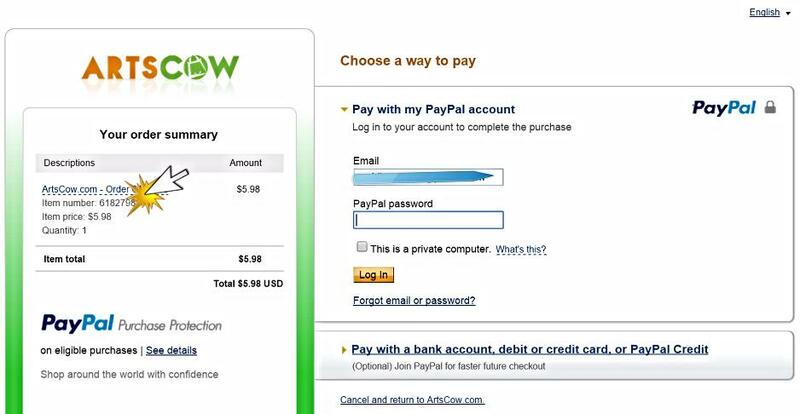 I usually pay through my Paypal account but you can also use credit cards. These payments are sent without sharing financial information so if you use Paypal to pay online, you only provide your Paypal email address, and this information will be stored on Paypal server only. These merchants/retailers will receive payment from Paypal without seeing your financial information. You can visit Paypal Security Center, there you'll find useful tips, tools and technology to prevent fraud for more security and safety advice. The Shipping Method as well as Transit Time is important to customers especially those who order international. Their Regular Airmail generally takes 7-12 business days. The FedEx takes 2-4 business days. ArtsCow could offer price bulk discounts to customers who would like to purchase large quantities of any of their items so try to contact their customer service for further information to save you more money. ArtsCow is great for people who love taking pictures and bring those memories by simply customizing and personalizing them through their online photo printing, sharing as well as storing platform for which a customer can easily share and remember those precious moments with family, relatives and friends. They provide a huge selection of personalized photo products at affordable prices ranging from photo books, clothing, school products, office supplies, home furnishing items, and electronic accessories. They have good products and services for their customers with many selection of their themed design templates as well as kits for every occasion using design tools that will allow anybody to design with ease. If you are a creative person, you may also like to order and design an item with a coupon code so that you can also enjoy saving. They usually give your 30 days guarantee on all products so if ever you would like to return or exchange an item, you can easily contact them through their website and ask for a request form. You can fill out the form and they will instruct you on how to send the item(s) back but keep in mind before you order anything that the shipping charges are not refundable. You could retrieve the photo files that you had stored in ArtsCow by checking "My Album" and choose the folder which you want to download those photos from. If you already have selected the folder, tick/click the photo files you wish to retrieve. Simply click the “Download" button on the top, right hand corner. You can also find your outstanding credit balance within this webpage. Every file requires 1 credit for download so you could buy a download credit for $0.1 each. Simply click on the "Download" button at the top of the page to start downloading your original photos to your hard drive. If you like to keep your items looking as good as new, hand washed them in cold water only especially for clothing, bedding items and more. The reason for this is that, Artscow had used advance heat sublimation technique for printing. They offer their customers points and this is kind of fun too. So for product reviews, they offer 10 points. If you successfully register and confirm your account, they give you 10 points. If there is a purchase made through your referral codes, you can receive 10 points. If a friend confirms registration through your referral, 10 points will be added to your account. If you confirm registration through referral, you receive 20 points. The Points Redemption happens when you can reach 250 points for $5 (Cash Dollars) or 400 points for $10 (Cash Dollars). Artscow offers product previews in order to simulate the actual product to allow you a better view of your designs. However, they are only for reference because the actual products could vary from the previews that were shown. For new members, you can easily find free credits for various items already added to your account. Credits will also be given occasionally out to all members during their promotional events in which a particular code will be provided and has to be manually validated on the Credit and Discount webpage prior these credits can be used. The Credit and Discount webpage will let you keep track of what credits are still active on your account. All the free credits in your account can be applied to your order at checkout. If you want to redeem a coupon code, simply add the items to your cart and proceed to checkout. Type and enter the coupon code into the Coupon/Gift Certificate Code box and then click "Apply". If the code is still valid, the discounted price will appear within the order summary. You will have an option or choice either to enter a coupon code or free credit that can be applied on the same item. Take note that their Free Credit will not be applied to the item if it’s already included in the promotional offer of the coupon discount. To be updated, you can read their terms and conditions for any of their promotions offered or simply contact their customer service team if you have any questions regarding promotional codes. They generally give promotional materials and information regarding their discounts and promotions once you subscribe. If you plan to subscribe to their newsletter, you also need to check your junk/spam mail folder as some emails could go directly into your junk/spam folder. Your email provider may not be able to recognize the domain it has been sent from so try adding the "no-reply@artscow.com" to your email contacts or safe sender list to ensure emails go directly to your inbox folder so that you can be updated with their new promos and discount offers. They have photos upload options where you can choose as My Album or Product Designer. Simply click "My Album" through your account page, and then create a new album. You can now choose between basic upload and quick multiple upload. Based in my experience as a customer, installation of the Microsoft Silverlight makes your designs faster. With the Product Designer, you have the option to upload photos inside the product designer page. Simply click "Album" button in the top, right hand corner to your upload photos. If you have a Facebook account, it is easy to upload them by clicking "My Album" at your account page, and click "Facebook". You must first log into your Facebook account first, then click "Allow" to grant permission to import photos from them to the ArtsCow website. Once you return to the ArtsCow website, those selected photos from your Facebook account will immediately be displayed on the Artscow webpage. You can contact their customer service through their website to cancel or modify your order. Please take note that once your order has been processed and is at the manufacturing stage/phase or has been shipped, it can no longer be canceled or modified. You are still able to change the shipping address before the product is sent or dispatched by clicking "Amend" on your order confirmation email. You can also directly contact their customer service if you like to change the shipping address or method. Depending where you live, you may be subject to import duties and taxes. US customers who buy for a few dollars or so are not required to pay import duties and taxes so check out the country of where you reside because all items entering a foreign country are subject to customs inspection as well as assessment of duties and taxes in accordance with the national laws of a particular country. Generally, customs duties and taxes are assessed if the merchandise is dutiable plus the value of the item is above the threshold set by the country's present laws. If you plan to buy in bulk, you should contact your local customs office for further information since Custom policies are different for every country. Take note that when you order from them, as a buyer, you are also considered the importer of the goods and should comply with all laws as well as regulations of the country in which you are receiving the goods. 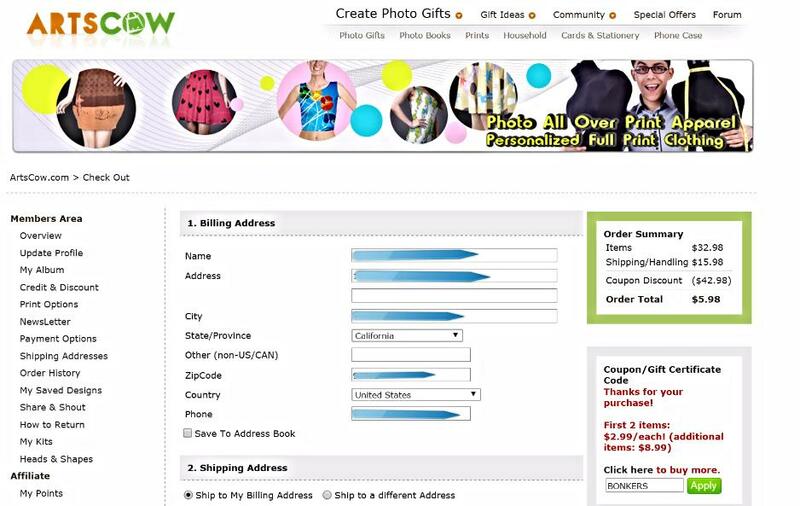 All their prices are listed in U.S Dollars but you need to consider that ArtsCow is a Hong Kong based company (part of Asia), so the final order total of your item/items will be processed as a Hong Kong Dollar (HKD) amount, which will be converted to your local currency by your card issuing bank. You may be charged foreign conversion charges and fees (less than 3% usually), in addition to the exchange rate, which could increase the overall cost of your purchase.